Which caused a few to frown. Dressed in red and black. He led his team across. Think they had too much to do. Jack Franklin scored a try. From just inside half way. Was downed within the line. He sent a message to the line. For Brereton with his oil. Who sent it out to Vest. And kicked her out of bounds. And sent it out to Keen. We must give the cake to Vest. Were delighted with his play. That they’d scored a try at last. They took it out and placed it. When he kicked it o’er the bar. Led his side to victory. And knocked the corner flag. For the games that they put up. – Anonymous, published in the Gundagai Times 5 July 1927 and related to this game. Since you’ve been here what have you did? – Words by ‘Gundy’ Norman, music by T. McVeigh, sung by Teddy Taplin. You have made us feel quite blue. We’ve missed you in every way. We love all the cups we lost at football. But first of all we love but you. – Words and music by Dud Doidge, sung by Phil Regan. 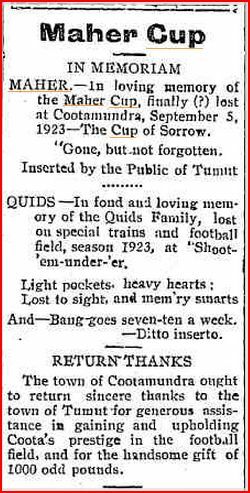 – published (with apologies to ‘Banjo’ Patterson) in the Cootamundra Herald on 23 May 1939. This poem relates to the 1920s. The Farrer Cup was put into play by Wyalong and much loved there in early days. That they formed an institution called the Wyalong Football Club. And the ground was never trod on that the ‘black-reds’ couldn’t stride. And they used to train for football wheeling goannas in the scrub. That another club existed called the Cootamundra football team. For its members were distinguished by exclusliveness and dress. They had natty blue-white guernseys, and their boots and pants were slick, For their cultivated owners only donned them once a week. And meant to show the Wyalongites just how to play the game. And gathered up some hundreds more from all along the line. ‘Ere they started operations on the Wyalong Football Club. When the Wyalong boys got going, it was time to clear the road. Jack Quinn grew hoarse and dizzy, and ‘Juggler’ sang out loud. Stan Love’s leg got broken just from merely looking on. ‘Oh, dear !’ said Brian O’Connor, ‘why did I come to play ! I came to fix up Brogan, and got crippled in the fray’. Was the last surviving player, and Wyalong couldn’t tie. Though his wounds were mostly mortal, yet he fiercely gazed around. So he scrambled to the football for his last expiring chance. So he kicked at the ball, and missed it! then he tumbled down and died. For the Wyalong football players and the Coota boys lie here. With Fraser, Franklin, and ‘Dutchy’ all sleeping here with Vest. You can see their shadows flitting ‘cross the Wyalong football ground. The referee’s shrill whistle, and the rush of players’ feet. He’s been haunted by the spectres of the Wyalong Football Club. – by ‘Old Sport”, published in the Tumut & Adelong Times 21 May 1935 to celebrate this win. By the Tumut team of Blues. And take the trophy back. Though some are wanting two’s. Then, roll up, boys on Wednesday! To see these rivals clash. The game should be a thriller. Joe’s Tumut team of Blues. Of the Tumut football ground. From the team from Gundagai. A good city one, you know. From the very word to go. With their ‘Go on, Gundagai! And the play was hard and fast. Drawing first blood for the Blues. Then Tom Kirk he landed three. When Smithy kicked a goal. On the road to Gundagai. And good football on the whole. When play got in the open. And touched down across the line. As the ball it crossed the bar. It was just on fifty pounds. Loud cheers went round the ground. The famous old Maher Cup. Of the Cup they call ‘The Maher’. – published in the Tumut & Adelong Times 17 June 1947, from the original in the Temora paper. It reflects this protest. Baa baa Harden, have you any cup? and only hope we’ve won. Judiciary consisting of you own Sergeant Buck. He ought to be here, said Dan Ledwidge. And he ought to be here by this. Who would never more come back. Oh, what has become of our Joseph? Why isn’t he home tonight? But if ever he has an equal. It will be Bill Leseberg’s ghost. Through the gums and stringy bark. That Ex-Australian captain struggled onward through the dark. In Junee they sighed and waited. But hope died out with the daylight. And the last available train. And they played young Diggens instead. And stamped on Dan’s pale features. — He was awake to Joe at last! – Mudlark, in the Boorowa News 1 August 1952, just after Boorowa lost (another) challenge. ‘We’ll lift that cup or bust’ . And swore, and cursed, and cried. When he sold his team for meat. This entry was posted in Demography, Communications & Media and tagged Cootamundra, Gundagai, Harden-Murrumburrah, Junee, Poetry, Tumut, West Wyalong. Bookmark the permalink.